Hundreds of ruling party commune chiefs across the country have now signed nearly identical letters accusing the opposition of using an “inciting” campaign slogan to fan “disunity,” echoing the language of brand-new legislation that could see whole parties dissolved for such behavior. Senate President Say Chhum, acting as head of state in the king’s absence, signed off on the controversial set of amendments to the Law on Political Parties on Tuesday, bringing them immediately into effect. Government-aligned Fresh News started posting the complaints online on Tuesday night from CPP commune chiefs in Phnom Penh. It has since posted more than 300 from the capital and five provinces. Though the CPP denies orchestrating the flood of complaints from its party chiefs, it follows on the heels of a public statement from party headquarters rebuking the slogan on the same grounds and threatening to sue the CNRP unless it is changed. The complaints also bear remarkable resemblance to each other, straying only in the details of each chief’s self-proclaimed achievements on the job. CNRP lawmaker Son Chhay, a member of the opposition party’s steering committee, said it beggared belief that so many CPP commune chiefs would simultaneously and spontaneously make such public complaints without approval from the party leadership. “The way the CPP operates, they would not do this kind of thing without permission from their leaders. So we assume it could be activity reflecting the original complaint by the ruling party,” he said. 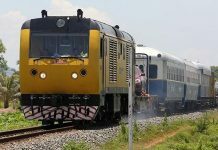 The CNRP would keep using the slogan unless it was convinced it was illegal, the lawmaker said. “Unless there is some kind of evidence…I think the party sticks [to] what we have decided,” he said. The Human Rights Party, which merged with the Sam Rainsy Party in 2012 to form the CNRP, may have used a similar tagline five years ago. “If that’s the case, it caused no harm,” he said. The CNRP has defended its slogan, arguing that it does not name a party and that the opposition—under the two legacy parties with which it contested the last commune elections—have a few commune chiefs of their own who are also vulnerable to disgruntled voters. The government’s National Election Committee is charged with ensuring free and fair elections and ensuring that contenders stick to the rules. 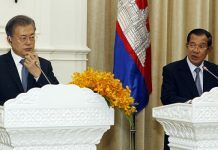 But committee spokesman Hang Puthea declined to weigh in on the CNRP’s slogan on Thursday and said he and his colleagues would only scrutinize it once the official campaign period begins on May 20. But the CNRP could find itself in court well before that. CPP spokesman Sok Eysan initially said the party would sue the CNRP—if it insists on sticking to the slogan—with the Law on Commune Administrative Management, which lays out the role and remit of commune officials. But he would not rule out using the amended Party Law. After the changes passed the CPP-dominated National Assembly and Senate last month in sessions boycotted by the outnumbered opposition, which called them unconstitutional, Mr. Chhum signed off on them on Tuesday. He signed them in the absence of King Norodom Sihamoni, who left for China last week. 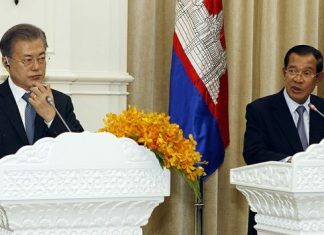 On Thursday, Senate secretary-general Oum Sarith confirmed that the amended law took effect with Mr. Chhum’s signature. 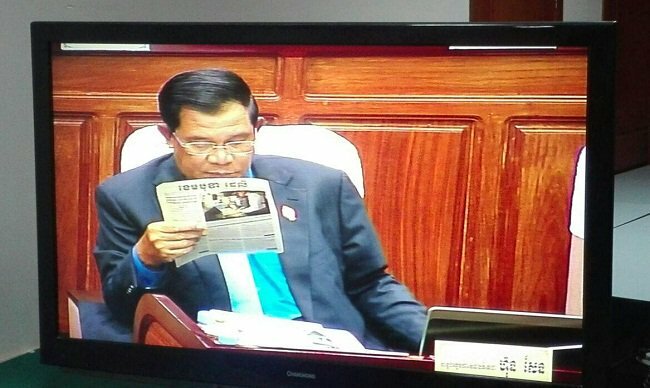 Prime Minister Hun Sen has said publicly that he wanted the new powers specifically to target the CNRP. The CPP dominated the 2012 commune elections, winning over 70 percent of the vote and securing a commanding 1,592 of the 1,633 commune chief spots up for grabs. But that was before the CNRP was established, and it won nearly half the vote in national elections the next year. Losing a significant number of communes this June would be embarrassing for the CPP, which has run the country uninterrupted for 35 years, and may prove a bellwether of the CNRP’s strength in the national elections set for next year. Cham Bunthet, a political analyst and adviser to the Grassroots Democracy Party, said the complaints accusing the CNRP of incitement and of fanning disunity were a deliberate echo of the amended Party Law and could end up as fodder for the CPP’s threatened lawsuit. “It’s definitely going that way,” he said. He called the CPP’s case against the slogan “ridiculous” and “irrational,” but said that would not stop the ruling party—widely believed to have the courts in its pocket—from using it.